It's here! The long awaited and requested no-fee EDI testing platform has arrived. Since the last announcement in mid-January, the system has been in testing with a major retailer and some well-known CPG brands. The feedback has further motivated the development staff understanding the unique value to users and the superior functionality above other EDI testing platforms on the market today. Check it out for yourself. Click here - register, add your company and contact info. Upload your specs and edit them in the spec building tool. 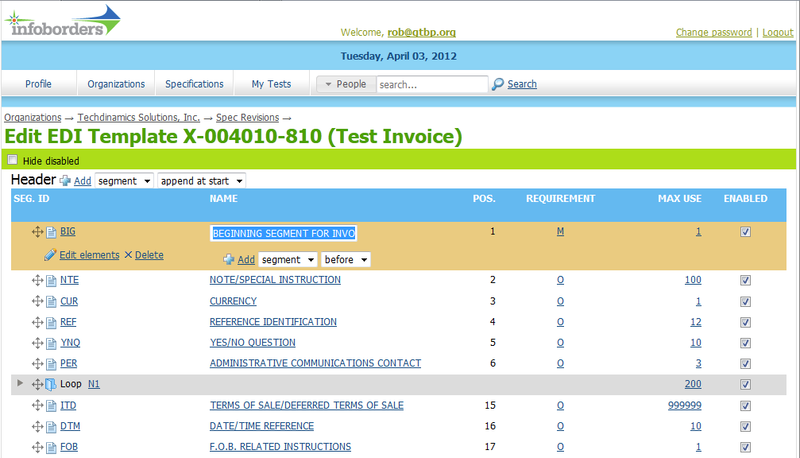 Test your EDI transactions, invite your trading partners to test the transactions, collaborate in one place. Infoborders looks forward to further feedback in the V1 release of a tool that just cut the time and expense to implement new EDI transactions and trading partners. It is open for any professional EDI Analyst to use. Users are encouraged to provide feedback and add their content and the content of their trading partners. It is a first version and additional functionality is already in the pipeline but the system is ready for production use. Search on Save Mart in EDI specifications as an example of EDI specs designed by user for testing.